Hello again! 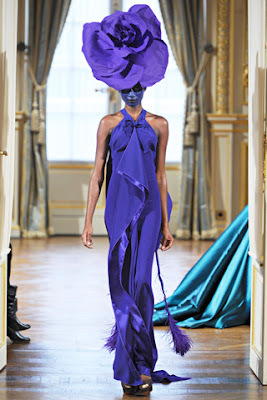 Here to introduce those of you who do not know who he is to Alexis Mabille - who, although I have been very much aware of for a couple of years, has only just become one of my Fashion crushes. Those of you who will already know him, we can simply sit back and appreciate. Why? Because even though some of the clothing is not enirely my cup of tea (and I know this last collection wasn't widely received very well) his haute couture lines are beautiful, the first I saw, the Couture Spring/Summer 2011 collection... which was absolutely to die for! Oh, and I simply adored the amazing soundtrack. Does anyone know exactly what any of it is? Some of it does sound familiar. Now I would a floor-sweeping cloak... although I have done for quite a while. The only difference this time is that I want a gauzy, white one. Alexis Mabille is, in my opinion, a talented designer with deliciously luscious designs: luxurious, sophisticated, dynamic, beautiful, imbued with fantasy and an element of both flamboyance and eccentricity. Although I know many people were not impressed by this new Spring/Summer 2012 couture collection - they felt it lacked a grand couturier's instinct. Lacklustre. Or "The concept of these dresses is respected however the delivery does lack some level of refinement necessary for a couture collection." 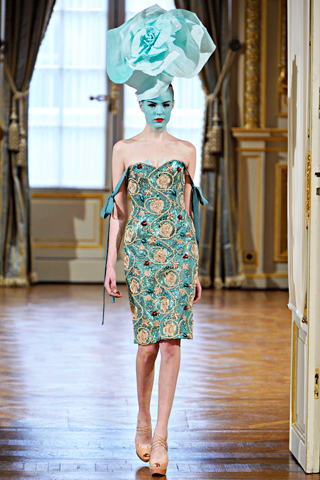 and also, "Even the most modern looking pieces seemed to be re-treads of things Mabille has done in the past. The whole color thing seems like a gimmick﻿ to try to keep such a haphazardly inspired collection together. 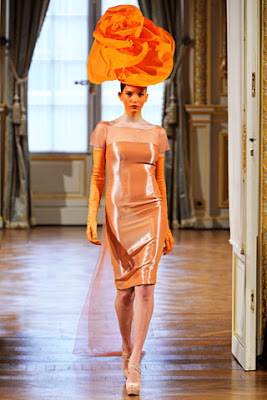 Yeah, it works as a spectacle, but if you take each dress on it's own they're nowhere near groundbreaking and are barely worthy of the term couture. And what's the deal with the trim on the final dress? It would have been perfect without it." Maybe so, but there is a certain amount of unfairness here. I am sorry, re-treads of things done in the past? Hmmm... that remind me of a very famous brand called Chanel. Even though I appreciate Chanel, it is years since anything new has been done. Yes, I know the Chanel Jacket and skirt formula works and we all need some classics in the great brands. Yes, I realise that there is a certain image. However, there are certain brands where everything is so established, nobody would dare say anything. 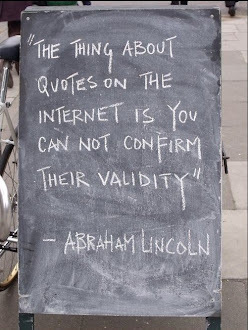 It is generally agreed that certain people are geniuses. If this collection had been presented by Chanel (which it would not have, it is not really their style at all) or, more likely, Dior, then I am sure the reviews would have been slightly more positive. I am therefore not really in the mood to attack Alexis Mabille. Not as good as his last collection? Definitely. Fun to watch? Yes! Nothing is truly original. Ever. I like the fact that he is somebody who obviously loves fashion stating, when asked what his inspiration was, a photograph of iconic model Lisa Fonssagrives on a beach, her face suffused with pink from the sunlight coming through her umbrella. 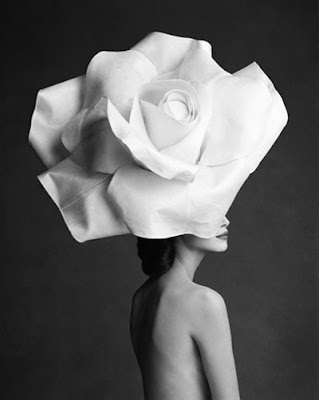 Along with a more recent picture of Christy Turlington by Patrick Demarchelier. Again, this was almost a cause for criticism. "There was scarcely an outfit that wouldn't have worked a miracle in a Hollywood film from the thirties or forties or fifties that called for the heroine to wear "fashion." 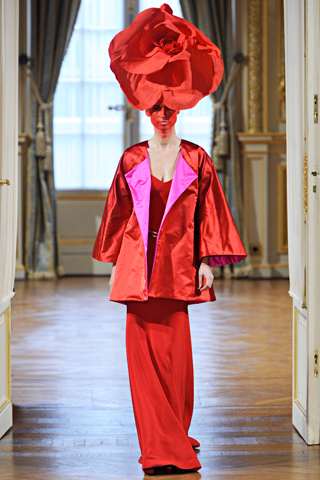 Take a look at the kimono jacket in pink-lined red satin over a red column dress, or the peignoir of palest blue tulle over a full-skirted gown. 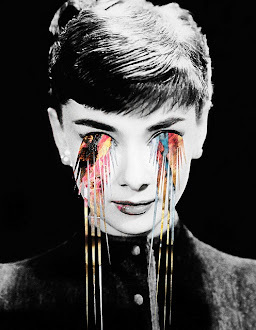 The painted faces only emphasized the artificiality of the clothes." I am going to admit that the gold dress was pretty horrendous, but I liked the painted faces. At least he knew his concept. Take for example, Versace. A set constructed with mirrored steps that was just as glistening as the dresses themselves. Each girl walked down in sky-high Versace gladiator stilettos, giving the audience a look at the beautifully beaded works of art in colors like silver, copper, gold, and even orange. 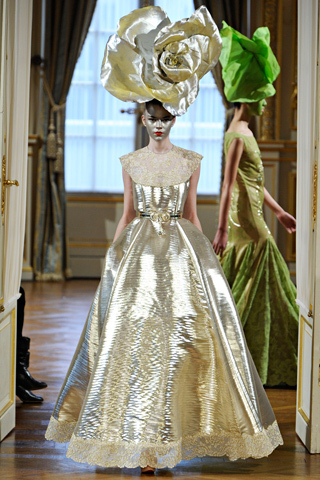 Metallic insets giving the dresses a sculpted touch and a mix of high-end warriors meets futuristic space glamazons. My main problem was not with the dresses. Too Versace (not all off it. 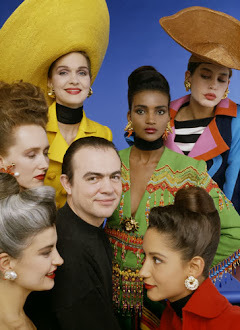 I actually thought that some items were wearable) and the models' hair scraped into what looked like a designer version of a 'croydon facelift' - I could manage that. 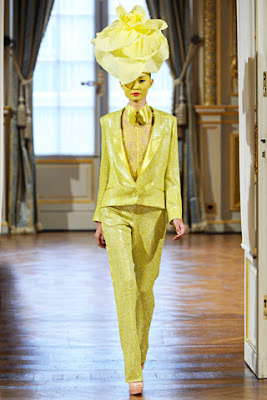 No, the significant problem for me was that I found Versace's couture collection really hard to watch. It was the way the models carefully made their way down the steps that did it for me. Very awkward to the point of being funny. The music was very wrong too. It did not fit the situation, and I think it might have been classier with something less Operatic, more 1950s Hollywood. It was as if Donatella was trying to add culture to a brand that has very little. 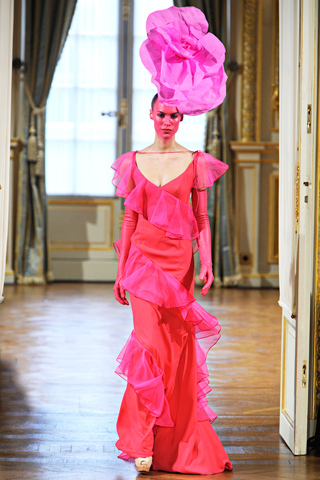 At the very least, the music at Alexis Mabille was appropriate and did not detract from the clothes, instead working together in technicolour, clashing, rainbow harmony. <<< Beautiful Kimono Jacket. I really like the pink lining - so stylish, colourful and chic. One would naturally feel lovely wearing it. Not that I would ever know. >>> Aaaah! Attack of the sleeves. 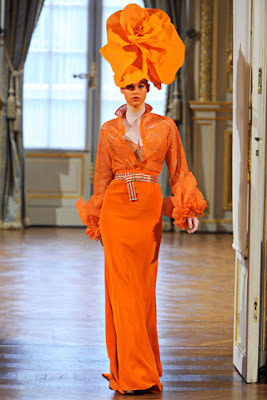 <<< I adore this vivid Orange ensemble. I actuallyr really like this, would wear it if I had the money and will not hear a word of criticism about the colour or the frills. >>> This one? Less so. Less my style but still very nice. 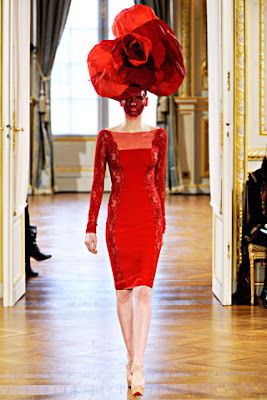 Probably would not wear it, but I know many people who would say that this dress was the best element of the collection. It is just a matter of taste and situation. 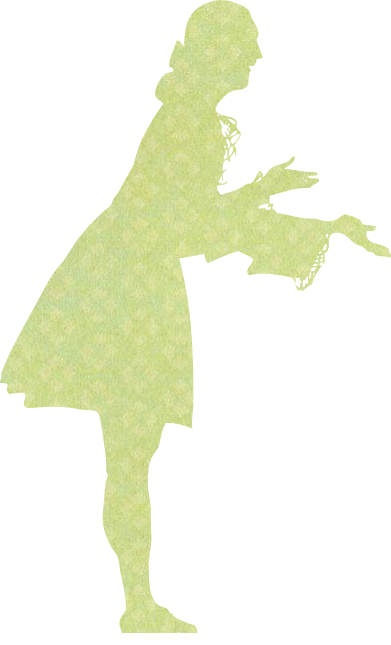 I challenge anyone to have a jig in the orange dress. >>> Even though I like Alexis Mabille, I must say that this dress was pretty hideous. 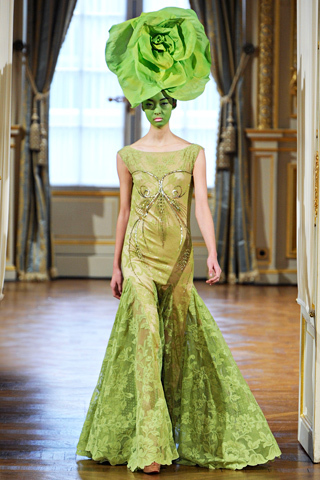 I am sure that there were members of the fashion world who loved it, but to me it looked like a cabbage among the flowers. <<< The acidic yellow was my second least favourite. I almost like the bottom half though. 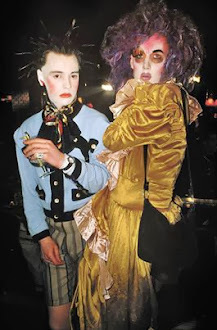 I completely adored both of these, more pastel, ensembles. 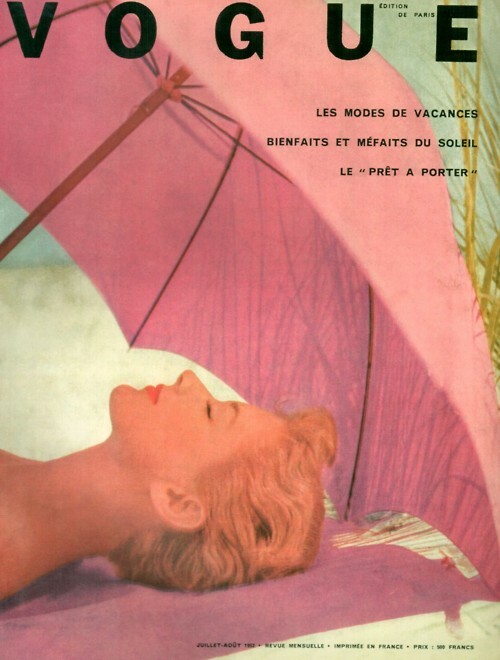 Floaty and Lady-like, with waists and floor-length skirts. Yes, they both remind me of something done by Dior quite a few seasons ago, but they are luscious with an almost ethereal air. I even think the flower works charmingly and refuse to hear otherwise. 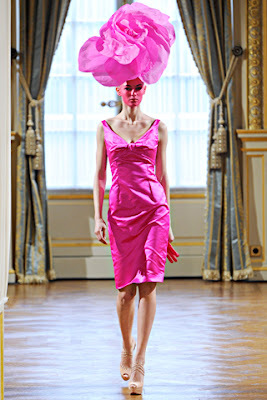 Something for Ascot anyone? 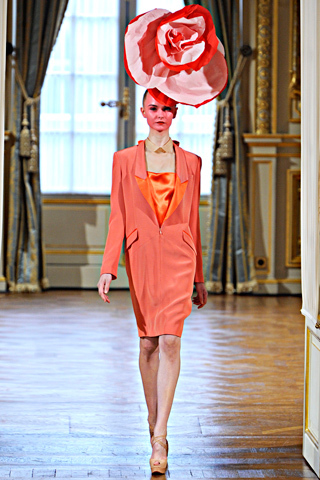 In short, whatever anyone may say, I am standing behind Alexis Mabille, for better or for worse. (Does anyone know if that is his real name? 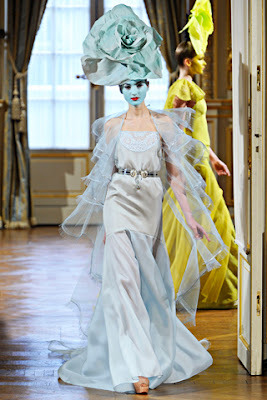 Only Alexis Mabille sounds like Alexis m'habille, which would be quite a clever name for a fashion brand) I cannot wait to see his Autumn Couture Collection. 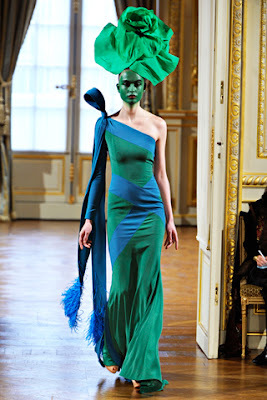 On a last note of mild fantasy, when I am ruler of the world and Jean Paul Gaultier shall be creating the costumes for West End Productions of 'South Pacific', Alexis Mabille will charged with the costumes for the flowers in the West End version of 'Alice in Wonderland' - as well as doing what he is already doing, because creating clothes for the catwalk is mildly more important. those hats are really stunning! i couldn't agree more with your comments about chanel and versace and other popular brands and their luck of new ideas. although i am not a big fan of this particular alexis mobille collection i admit that there were far worse than this and they weren't even judged. thanks for sharing with us, as always this is a beautifully written post. i am so jealous of your writing skills. 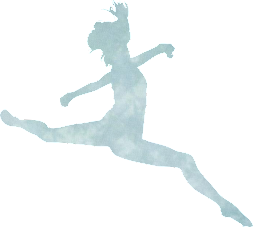 come by my blog sometimes. Hi! Good post, now I follow you too. 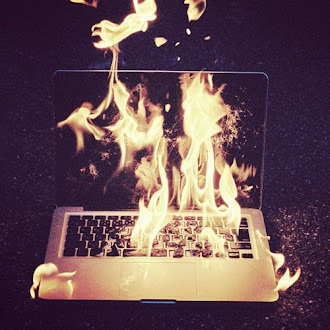 Zoe, love your blog. Great posts. I Followed you on GFC. Hope you follow back. 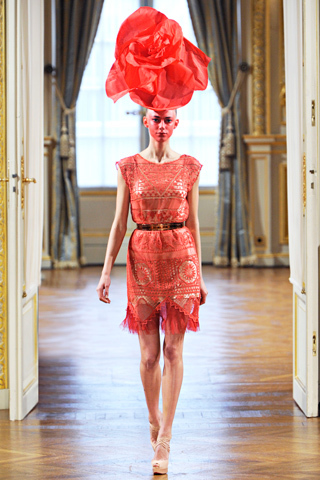 but the headpieces were gorgeous! Greetings from Spain! I'm your new follower! I love the way that you arranged your commentary according to the pictures! I'd never seen that done before, and it looks really cool! This collection is very interesting and stylish. Amazing colors. 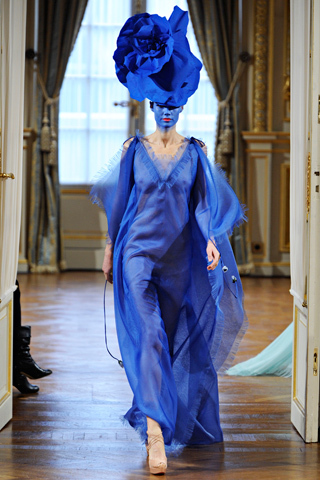 Alexis Mabille is so talented. Love this photo with Christy Turlington. 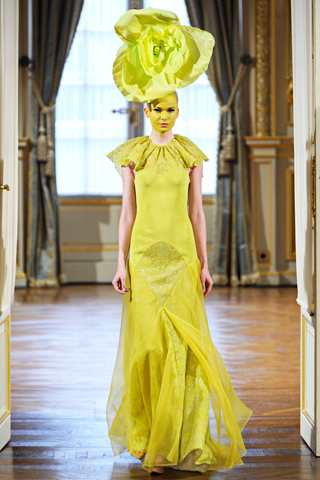 amazing couture picks! thanks 4 sharing! 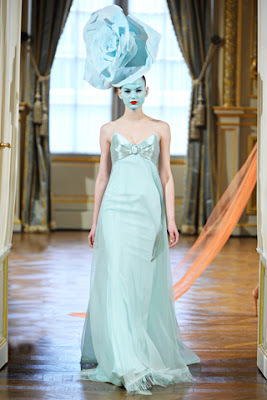 Alexis Mabille is new to me so thank you for this introduction. I really enjoyed the way in which you wrote about the collection. 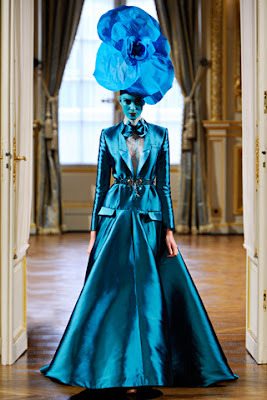 I find his haute couture creations quite beautiful and luxurious and though where I can see where the criticism stems, from my point of view his designs also look more wearable than those shown by some of the more well known couture houses. Thank you so much for your lovely comment! You're ADORABLE! I love Alexis's collection so much!